The guest house is completely non-smoking; smoking is prohibited throughout the territory except for the allocated space in the courtyard. Pets are allowed for extra charge under agreement with the administrator. The cozy rooms are designed in the Finnish style; the guests make self-check-in with the use of the codes provided. The keys to the rooms are stored in small lockers near the doors, the code allows you to open the box and take the room key. There are free tea and coffee, microwave oven is also available. 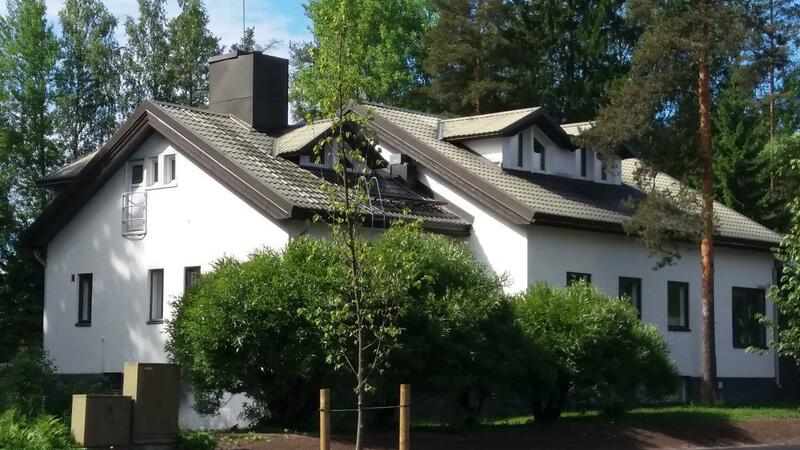 The convenient location of the guest house allows you to reach the Imatran Kylpylä Spa located just 4 km away in 5 minutes’ drive. Free parking for 9 cars and separate parking for bicycles are available. Small grill and barbecue in the courtyard. Imatran Portti is open all year round and welcomes you at any time. Area 10 sqm. 2 beds with bed linen, towels, table with chairs, bedside table, floor lamp, lighting, heating, floor mat, shoe rack, coat rack, hangers, mirror, waste basket. Area 12 sqm. Large double bed with bed linen, towels, table with chairs, 2 bedside tables, 2 floor lamps, lighting, heating, floor mat, shoe stand, wardrobe, coat hanger, mirror, chest of drawers, waste basket. Area of ​​20 sqm. 4 beds with bed linen, towels, table with chairs, bedside tables, 2 floor lamps, lighting, heating, floor mat, shoe rack, wardrobe, hangers, mirror, waste basket. Area 24 sqm. 3 beds and 1 bunk bed with bed linen, towels, table with chairs, bedside tables, 2 floor lamps, lighting, heating, floor mat, shoe stand, wardrobe, hangers, mirror, waste basket. Upper level of bunk bed is only for children. Area 42 sqm. Bedroom with 2 beds, bedside tables, 2 floor lamps, hangers, coat hanger, wall rack. The living room has table with chairs, 1 bed and 1 bunk bed, armchair, floor lamp, coat rack, coat hanger, mirror, bedside table, flat-screen TV, coat rack, coat hook, shoe stand, mirror. Own fully equipped kitchen and bathroom with WC. Free toiletries, hairdryer. Bed linen and towels, lighting, heating, waste basket.